Despite a name that comes across as slightly bizarre in English (it means "divided rooms" in Japanese), this puzzle has a unique charm and solves in a way quite unlike any other puzzle. The aim is to shaded certain squares, so that if you were to stand in any of the squares then you would never be able to see more than two of the bold-lined 'rooms', including the one you're standing in. 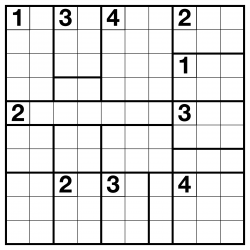 You can see only along the same row or column, up to the first shaded square. It takes a couple of minutes to get the hang of this, but once you do this relatively simple rule leads to surprisingly complex logic. 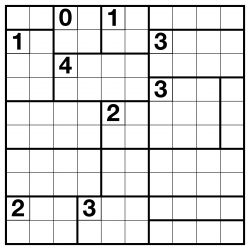 Like many Japanese logic puzzles, shaded squares cannot touch (except diagonally), and all unshaded squares must remain connected into a single area. 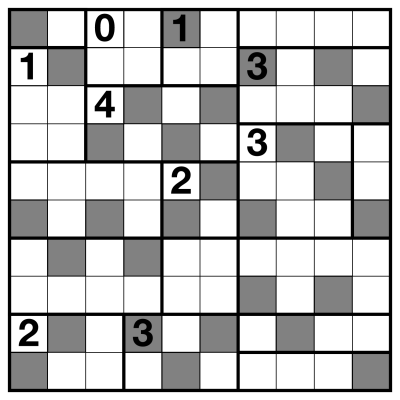 Squares with clues in can be shaded (and often have to be), and rooms without a number in may have any number of unshaded squares (including zero).